Chicago city officials have made good on their threat of legal action against Jussie Smollett, filing a civil lawsuit Thursday seeking to recoup the cost of a police investigation into what they believe was a staged attack the “Empire” actor orchestrated on himself. The city Law Department last month demanded Smollett pay back the $130,000 the police department expended on overtime as it investigated his claims, saying that if he refused, he could face a civil suit or prosecution for violating Chicago’s municipal code. Document: Read the full complaint. Celebrity attorney Mark Geragos, who represents Smollett, responded to the city’s demand last week in a letter, reiterating his client’s innocence and calling for Mayor Rahm Emanuel and Chicago Police Superintendent Eddie Johnson to both be deposed as part of this lawsuit. “Your letter constitutes part of a course of conduct intended to harass and irreparably injure Mr. Smollett,” Geragos wrote in an April 4 letter to Chicago Corporation Counsel Ed Siskel. Days before the attack, Smollett texted Osundairo saying he “might need (his) help on the low,” according to the complaint. GPS and video records show the two men drove from the “Empire” studio to Osundairo’s apartment. During that time, they allegedly discussed the planned attack, with Smollett saying he was upset with the way his employers handled a racist and homophobic letter he had allegedly received days earlier. Once they arrived at Osundairo’s apartment, Smollett allegedly asked the man’s brother, Ola Osundairo, if he could trust him. The three men then began planning the attack, the complaint states. The day before they carried out the hoax, Smollett drove the brothers to the area where he wanted the attack to occur, the complaint states, making sure to point out a nearby surveillance camera he hoped would capture the incident on video. Smollett then allegedly gave Abel Osundairo a $3,500 check and provided the brothers with $100 to purchase a rope and other materials needed for the attack. On the night of the attack, Smollett was traveling back to Chicago from New York and arrived later than he expected. According to the complaint, cell phone records indicate he called Abel Osundairo just before 1 a.m. and told him the attack would need to occur at 2 a.m. The brothers then traveled to the area via Uber, taxi and on foot and carried out the staged attack just after 2 a.m., the complaint states. They then ran from the area and flagged down a taxi. Smollett turned himself in to police after he was charged with a felony count of disorderly conduct for filing a false police report. Weeks later, a Cook County grand jury indicted him on 16 more disorderly conduct charges. 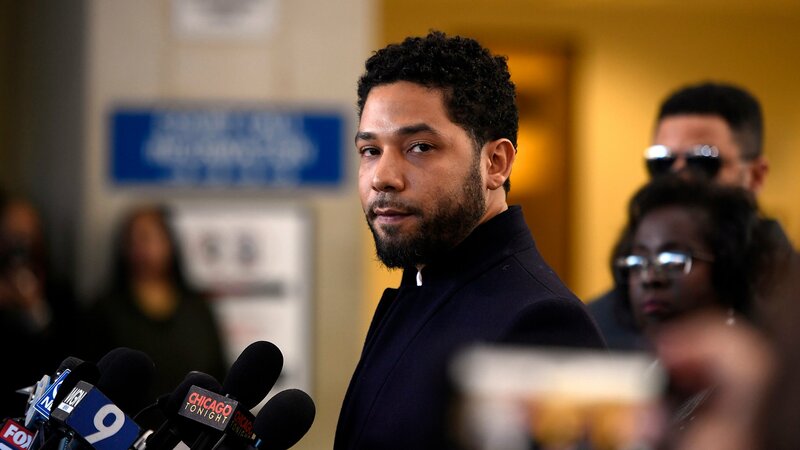 But in a stunning turn, Cook County prosecutors dropped all charges against him in late March, citing what they called an “alternative prosecution” that would allow Smollett to forfeit his $10,000 bond in exchange for his case being dismissed. The actor has maintained his innocence.